Air travel has turned into a mode of transport that gets people from point A to point B. Long gone are the days of treating passengers as valued guests. Instead, airlines give few perks to passengers and don't do much to provide comfort. It's something that frequent fliers notice as their ability to relax while in the air has diminished. But it doesn't have to be this way if you take some action prior to getting on the flight. Following are some tips to help you handle airplane annoyances and relax. Airlines have made their seats as small as possible to maximize the number of seats they can put on any given plane. It's a profitable strategy for the airlines and a loss for the customer. The pitch, or upright angle of the seat back has also moved closer to a 90-degree angle, which means more discomfort for the passenger. These seat changes are not only uncomfortable, they're also potentially dangerous. You can get around this by finding buttons on seats to determine if a seat arm can go up, if the back can recline, or if there's space for your legs that you can use by slouching a little bit. Find a travel pillow that offers comforts and supports your neck, and bring along an eye mask so you can sleep a little while in transit. Not being able to connect to the internet is a major drawback on flights for business travelers who need to stay in touch with work. You might be waiting on a major project to settle or you need to communicate with someone in the office and get a file. Whatever your problem is, you usually have to wait until you land to get in touch with everyone. Then you have to deal with the backlog that built up while you were in the air and unable to take care of issues. 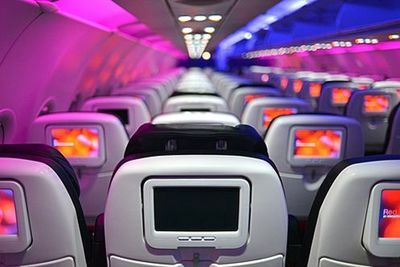 The best solution is to patronize airlines that have T-Mobile's GoGo Inflight Wi-Fi onboard. With this reliable network, you can connect to the ground, communicate with work, and find out what's going on while you're in transit so you can keep up with the flow. Food choices on planes are limited. And if the plane doesn't have what you like to drink, you're out of luck. Or are you? Nothing prevents you from bringing on your own food and drink, but this can take up space. While you can't necessarily shrink your snacks, you can shrink your beverages. Bring along a tea bag or a packet of freeze-dried coffee in your carry-on and ask for hot water when the cart comes down the aisle. An alternative option is to bring along a water enhancer in your favorite flavor and get a bottle of water from the cart. It's not polite to talk loudly on a plane, but people do it anyway. Then there are the seatmates who want to chat you up when you just want to rest. If you're not the type to be direct, you wind up suffering from the noise and unwanted conversation. The flight becomes pure misery and you're stuck with the conversation for two or three hours. Nip the problem in the bud with noise cancelling headphones and put them on as soon as you are able. Use a sleep mask and travel pillow to indicate you want to be left alone. And enforce your actions by asking the flight staff not to disturb you unless absolutely necessary. This tactic may be a little passive-aggressive, but if you're not in the mood to engage or listen to someone's conversation from five rows up, you need to go on the offensive. Otherwise, you're not going to get rest or be left alone. Flying doesn't have to be a miserable experience if you take a few preemptive measures. Use these tips to help you craft your own comfort and relax instead of fighting with common airplane annoyances.